Infowars host and nationally known conspiracy theorist Alex Jones traveled to Washington, D.C., this week to host a press conference aimed at rallying support for Infowars hosts and guests while they face defamation lawsuits and battle against what they claim is undue censorship from social media platforms. Early yesterday morning, Jones and his allies kicked off a press conference they said would address the multiple lawsuits that Infowars and its guests have been named in. But the conference quickly became just another venue to advance one of Infowars’ main objectives: attacking and delegitimizing credible news media. First on deck was pro-Trump pundit and One America News contributor Jack Posobiec, who has appeared often on Infowars. He read excerpts from an Eleanor Roosevelt speech about the importance of freedom and said afterward that he wanted to keep his appearance focused on the vague concept of individual liberty, rather than commenting on the defamation lawsuits that Jones and his crew are facing. But soon afterward, a host of Infowars staff and regular guests, including GOP “dirty trickster” operative Roger Stone, Infowars Washington bureau chief Jerome Corsi, Infowars reporters Lee Ann McAdoo and Millie Weaver, Sputnik’s Lee Stranahan and Gateway Pundit White House reporter Lucian Wintrich, joined Jones to speak at the podium about the lawsuits and the threat they claimed these lawsuits pose to their First Amendment rights. 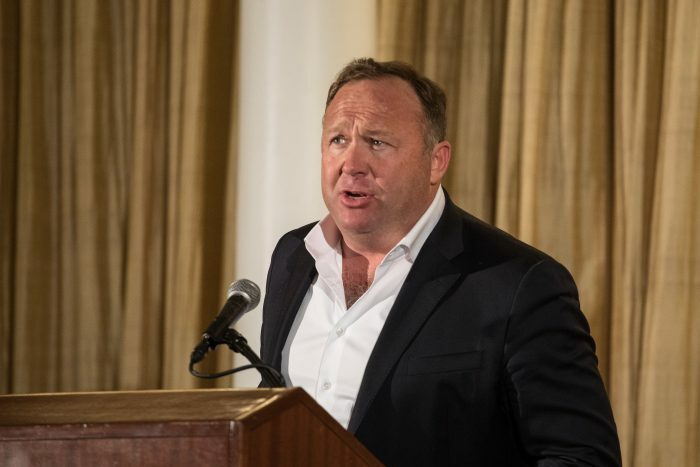 Jones made a point to tell press conference attendees that the National Press Club had removed its logo from the podium it lent to Infowars for the briefing. Jones invited attorney Andrew Grossman to speak at the podium. Grossman is representing Jones in a defamation lawsuit filed by Brennan Gilmore, whom Jones falsely claimed helped stage a violent attack at last year’s white supremacist “Unite the Right” rally. “Mr. 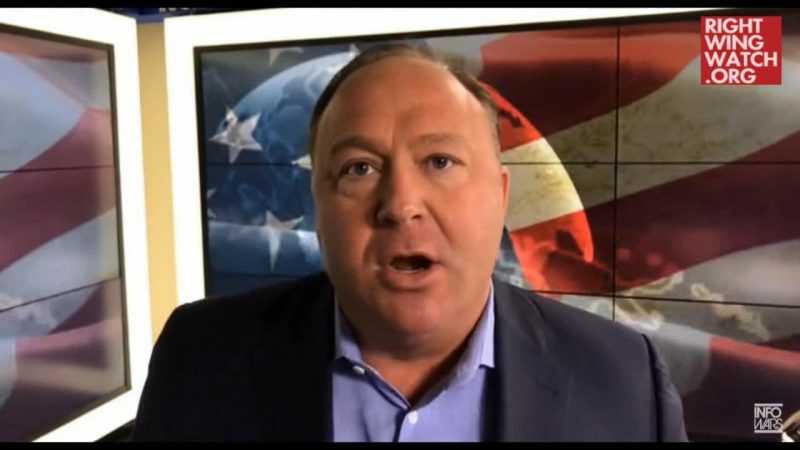 Gilmore’s claims against Alex Jones and Infowars were legally defective. 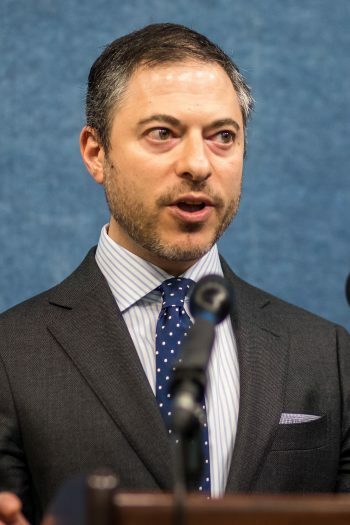 We are confident that the suit will be thrown out of court but, make no mistake, vexatious lawsuits like this one are dangerous because they seek to chip away at our cherished First Amendment rights,” Grossman said. Infowars distributed copies of a brief Jones’ lawyers had filed in the Gilmore case, which a couple of right-wing reporters asked Jones to autograph after the event. 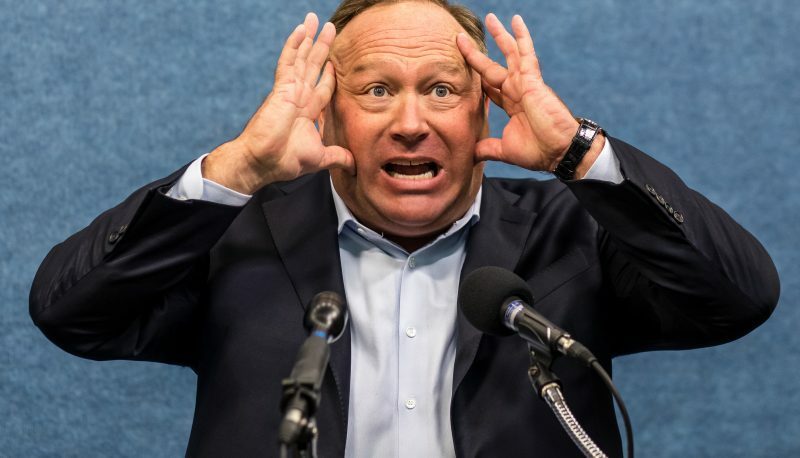 The press conference made no direct mention of other lawsuits pending against Jones, including a lawsuit filed in Texas that is seeking $1 million in damages for the alleged defamation of young man whom Infowars falsely claimed was the Parkland, Florida, shooter. 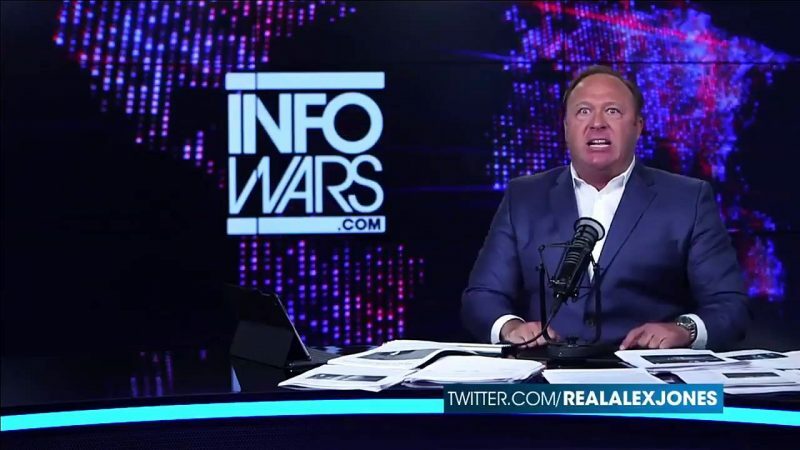 When asked about this case, Jones defended Infowars listing the wrong person as the Parkland shooter. Jones said he had been sued 13 times in the last year, for which he blamed the Right’s favorite bogeyman, billionaire George Soros. Like many of his guest speakers, Jones claimed that the lawsuits against him were designed to destroy the First Amendment, which he says would be the first step in an alleged plot to repeal other constitutional protections. 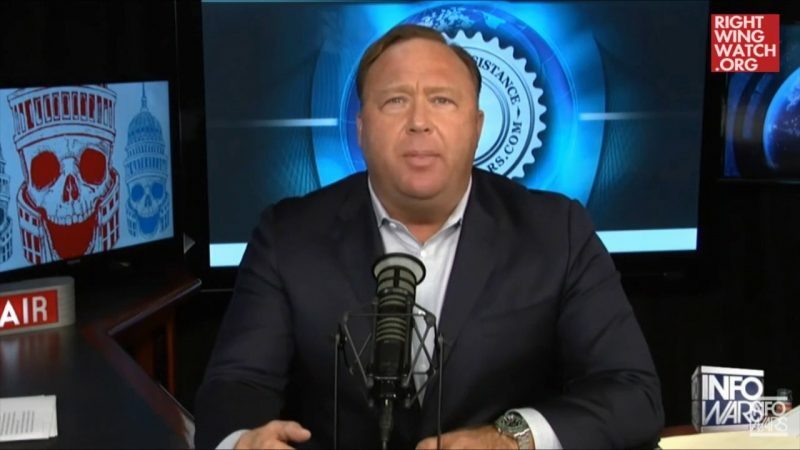 Jones said that the mainstream media “killed itself” and has since “circled their wagons” to defang the First Amendment and censor content creators like Infowars that have experienced success on non-traditional platforms like YouTube. Jones compared Twitter CEO Jack Dorsey to a communist dictator and alleged that the website ranking service Alexa had been rigged to disadvantage his website. The press conference didn’t appear to attract any reporters from prominent news outlets, but it did feature a few familiar faces from right-wing social media and a myriad of “citizen journalists” representing obscure right-wing YouTube channels, such as “Trump Talk US.” Jones theorized that mainstream media outlets had ignored his press briefing because they were adhering to a “business plan” designed to destroy him. One man seated in the front row held an ornately bound copy of the Bill of Rights. After the press conference, I approached Jones in the hallway and asked if he would answer a few questions for Right Wing Watch. ThinkProgress reporter Luke Barnes was standing next to me. Soon afterward, Jones left the building. But later that afternoon, he assembled another event in a ballroom at the nearby Mayflower hotel in front of another sympathetic crowd. Beneath the massive crystal chandelier in the Mayflower ballroom, about 75 people, which included many of the same people who had attended the morning press conference, with the addition of members of Gavin McInnes’ “Proud Boys” fraternity, former “Pizzagate” activist and Daily Caller reporter Martina Markota, Gateway Pundit reporter Cassandra Fairbanks, anti-feminist blogger Daryush Valizadeh (who goes by “Roosh V” online), One America News reporter Trey Yingst, and an older gentleman sporting a homemade badge that read “right wing extremist,” had gathered to hear Jones speak. The coffee that was provided at that morning’s press conference had been swapped for a large container of neon pink punch and a bottle of Absolut vodka that was blended together for attendees. As those seated at the event sipped their bright drinks, Jones and company took to the stage to rehash their earlier press conference and deliver a greatest-hits compilation of their accusations that technology companies are censoring them and false claims that Soros was a Nazi collaborator. Ivan Raiklin, who is seeking election to the Senate in Virginia and has earned the endorsement of Mike Flynn Jr., stopped Jones near the vacant press pit, handed him a business card and asked if he could speak in front of the assembled crowd. Shortly afterward, Jones introduced him on stage. 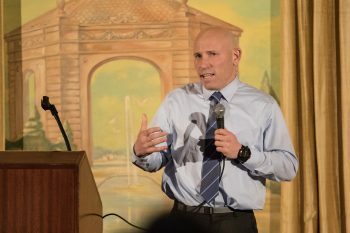 Raiklin told the crowd that, contrary to reports, he had actually earned enough signatures to run in the Republican primary but Republican Party officials had unfairly disqualified him. “My team was able to collect 12,600 signatures. We submitted that to the Party for review. They disqualified, last minute, a few signatures that were basically verified in a database that was a defunct, old database, so we’re now fighting this to be able to get ourselves on the ballot,” Raiklin said. 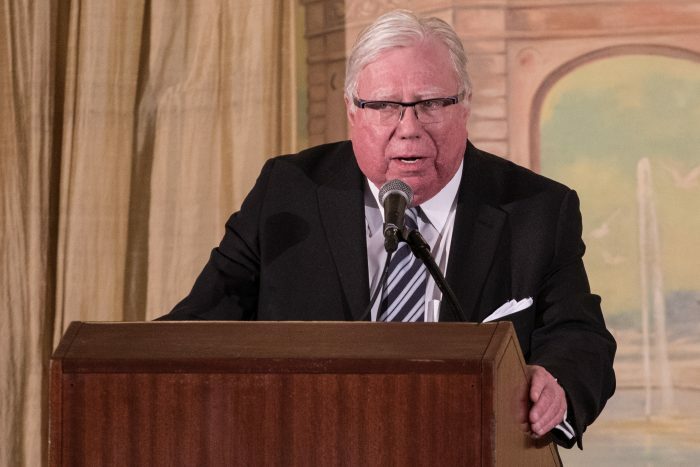 Afterward, Corsi took the stage to discuss QAnon, the anonymous author of more than one thousand cryptic riddles on 4Chan and 8Chan that Corsi and other conspiracy theorists believe to be a top-ranking Trump administration official. QAnon and the related conspiracy theory known as “The Storm” are topics that Corsi spends literal hours each day attempting to decode. “It’s put out through 4Chan because they find that that gets the best dissemination. And a lot of it isn’t even exactly accurate. It is meant to spook the other networks,” Jones said.